8 yr old, MN, Lab Mix, presented to rDVM for not eating, drooling from left, and had droopy left eye. Slight left temporal and masseter muscle atrophy noticed. Painful base of left ear, inflamed canal, eardrum not visualized. 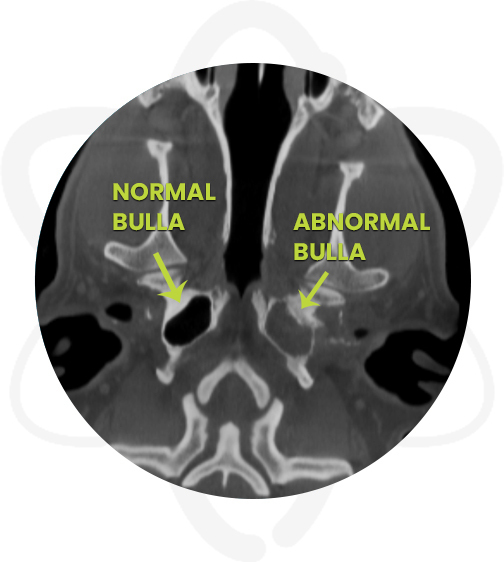 Normal skull radiographs. Skull CT was requested for further evaluation. Pre-Op lab work revealed slight monocytosis, otherwise unremarkable. Patient was anesthetized and a pre contrast CT scan of the skull was performed. Subsequently, Omnipaque ™ (contrast agent) was administered IV and a post contrast study of the skull was acquired. Severe left otitis media, bilateral chronic otitis externa and left medial retropharyngeal lymphadenopathy. All changes are likely secondary to chronic inflammation and infection with aural cholesteatoma formation. A neoplastic process is less likely but possible. These findings explain the facial nerve abnormalities. 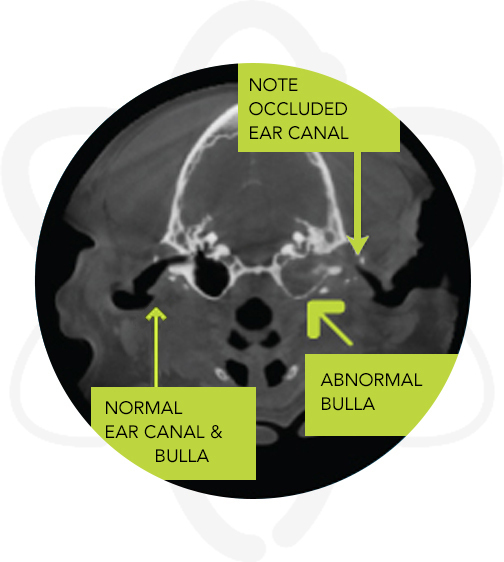 HD CT Scans are ideal to evaluate any patient with chronic otitis or any lingering ear disease. HD CT scans will provide invaluable information as far as extent of the disease and surgical options. The typical anesthesia time is 15-25 minutes in cases where IV contrast is administered and a post-contrast scan is needed; otherwise the anesthesia time is 10-15 minutes. Additionally, HD CT scans are a great tool for most diseases affecting the skull such as dental disease, skull fractures and nasal disease. For a detailed list of indications, please visit http://www.mobilepetimaging.com/indications/.